Interested in learning more tips, tricks and tools for your OT mTool Kit? A few more seats left! 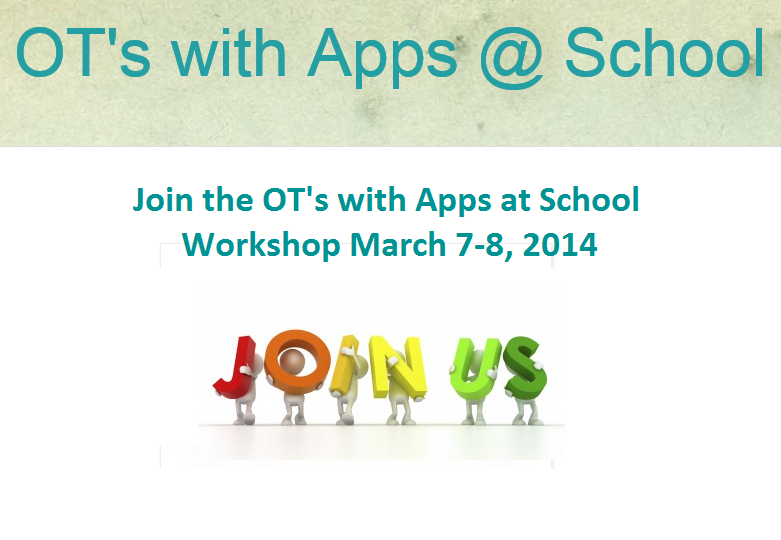 Join us for two “appy” days of apps, equipment and applications for your OT mTool Kit. Questions, feel free to contact me at otswithapps@gmail.com . Looks like a great workshop, do you do any on line as I live in New Zealand and it is a bit far to go! I am an ot working in private practice with children with learning problem and I use my ipad as part of my sessions. I have download a lot of the apps you have recommended and they are great. Webinars are something that are being explored at this time. Stay tuned for more information when that can happen!